While this pad thai is a little one-dimensional in terms of ingredients and color, I must say that it was absolutely delicious, especially for a first-time effort, and especially when I was not feeling like making much of an effort at all. It was Sunday and I needed something for dinner and Monday's lunch and I was not feeling particularly inspired. I was coming off of two weeks of dals, curries and chapatis and I wanted something different. I actually wanted to make my new favorite fried rice, which is fast and easy, but I had not made any rice, and I have learned the hard way that you really do want to make sure the rice is at least a day old, or you end up with more of a steamed than a fried application. So I decided that I would get some chicken thighs and just do a quick stir-fry with those. None of the vegetables at the store that day looked particularly good, so I just grabbed some green onions and decided to keep it simple. I did not want to make rice and I had been leafing through recipes for stir fries made with noodles, so I decided to check out the noodles in the Asian section of the grocery store. Imagine how pleased I was to find brown rice noodles. 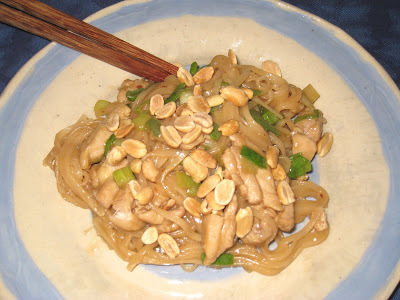 There were two kinds, maifun (angel hair) and pad thai. As soon as I saw the pad thai noodles I decided it was time to take a stab at it. I knew I did not have all of the ingredients for the "authentic" version, at least the version I have had most often at the many Thai restaurants where I have eaten it in Chicago, but I decided not to let that stop me. I used the recipes I had found in cookbooks and online more as inspiration than instruction. I didn't soak the noodles enough in the hot water, at least I don't think I did because it took longer for them to cook once I put them in the wok than the instructions said it would so I had to add more water to keep it from drying out. I dredged the chicken in cornstarch as I usually do when I am stir-frying, but that step was unnecessary, as the starch from the rice noodles was more than enough to thicken up the sauce. I didn't even have the energy to chop the peanuts so I just threw them on whole after the dish was plated. And even just by looking at the photo you can see that it is crying out for cilantro and lime. But even considering all of that, the result was a success, especially for a first version. I am sure I will continue to refine it, but in the meantime this recipe does the job, and it is easy enough for the novice. Combine the first 8 ingredients in a small bowl and set aside. Place the brown rice noodles in a large bowl of hot water and let them soak for about 10 minutes, until they are tender. Drain the noodles and set aside. Heat a wok over high heat. When it starts to smoke, add the peanut oil and swirl it around the bottom of the wok. Add the garlic and stir for a few seconds, then add the chicken. Let the chicken set at the bottom of the wok for a few seconds, and then start stirring constantly, cooking until there is no pink visible on the chicken pieces and they have started to brown. Add the whites of the scallions and stir fry with the chicken for a minute. Reduce the heat to low. Add the sauce and the noodles, stirring until the noodles have incorporated the sauce. Cook for an additional 2 to 3 minutes, or until the noodles are just cooked. Add the peanuts and the scallion greens. Serve immediately. Garnish with peanuts and cilantro.